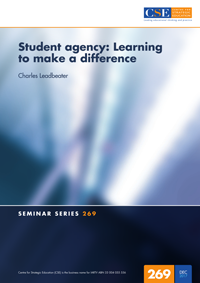 This paper on student agency stems from the author’s work as an advisor to the OECD Education 2030 project, and is designed to develop further the framework for learning that he set out in his book The Problem Solvers. He explains what he means by agency, explores the origins and development of the concept, and outlines what education would have to be like to ensure that learners emerge from schooling as confident, able, responsible agents of change. He identifies the essential components, levels and aspects of agency for this to be achieved, and comments on the required approach to learning.